One of my cats is our little watchdog. (His name is Kitten, lol) He likes to keep us posted when things are going on. One time in college he wouldn't stop howling in the middle of the night and I couldn't figure out what his problem was. Well, in the morning, turns out my boyfriend's car windows had been smashed and some very nice stereo equipment had been stolen. Kitten was just trying to let me know there was a thief outside! Well this morning he was going crazy by the back door. He was making all sorts of noises, not angry noises, but like, "Hey, Mom, come look!" So I went over to the back door and literally laughed out loud. 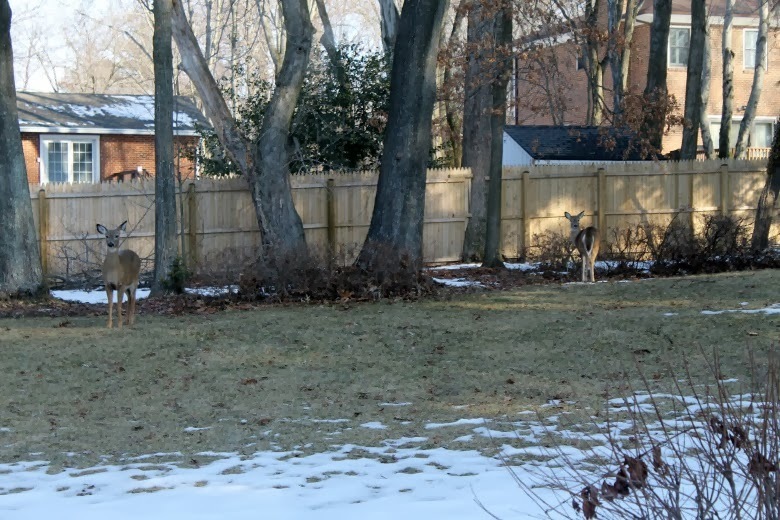 Kitten and a deer were in some sort of a throw down. Kitten is talking and swinging his tail back and forth (he thinks he's tough), and the deer has her (no antlers means her, right??) eyes locked on Kitten and is stamping her foot! I couldn't believe it! I ran to get my camera and started taking pictures. I couldn't get far enough back to get Kitten in the picture, but imagine him sitting at a big sliding glass door. 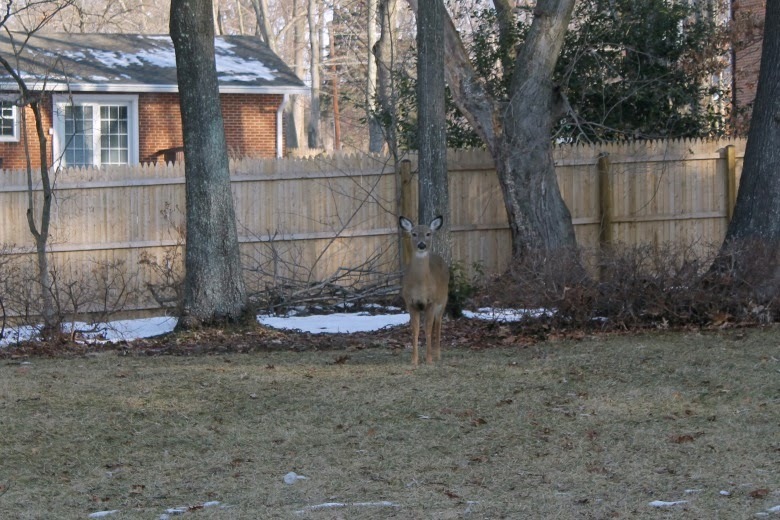 I then noticed movement out of the corner of my eye and realized this deer had a friend with her! And thennnn... this little baby came trotting out of the trees!!! 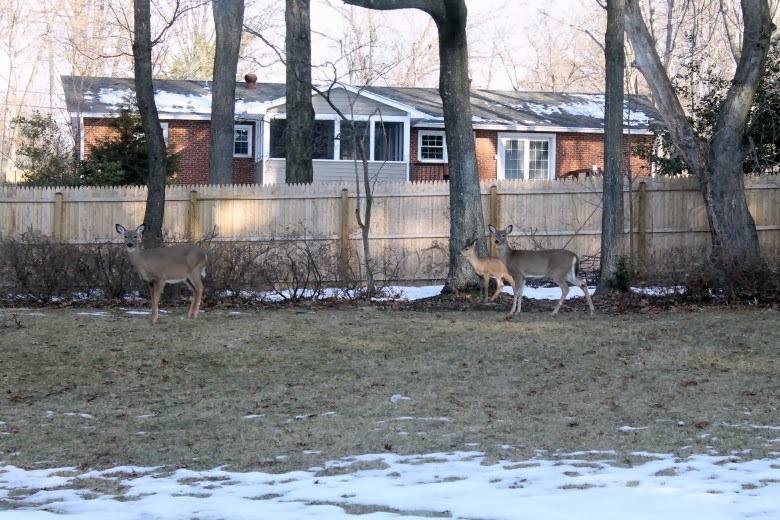 I think most people hate when deer get in their yards because they eat all the plants, but I don't mind. Don't get me wrong, we've got some bushes that have been given some funky hair cuts thanks to these guys, but it just makes me so excited to see critters in my yard! Maybe I should've been a vet... I would have a zoo if I could! Well that's all... just a little glimpse into my morning :) Have a great rest of the day!